Pelenna Patchworks: Lewis & Irene's To The Moon And Back now in stock! Lewis & Irene's To The Moon And Back now in stock! 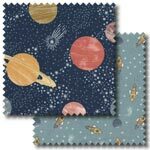 Ideal for youngsters who love the idea of space travel, or stargazers of any age, To The Moon And Back by Lewis & Irene is a stunning patchwork fabric collection that is really out of this world! 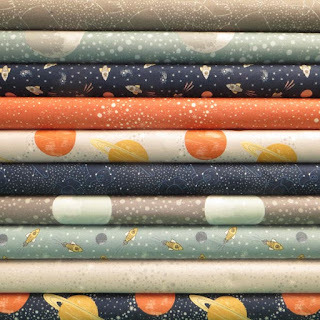 The range features motifs including planets, moons, rockets and starry skies, and the colour palette includes midnight blue, grey and earthy burnt orange. We have the full range in stock, plus fat quarter packs and stash packs of perfectly coordinating prints from the range - you get a 10% discount over buying the fabrics separately when you buy the fat quarter pack!